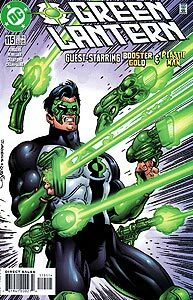 Brief Synopsis: When Kyle Rayner receives a misdelivered package, he finds himself confronted by an army determined to claim it. Issue Notes: The guest writer for this issue is Dan Jurgens, so it should be no surprise that the guest hero is Jurgens' own creation, Booster Gold. Shortly after waking, Kyle Rayner receives a package delivered to his New York City address by Blue and Gold Express, "When it absolutely, positively has to be there in ten seconds." The slogan for Blue and Gold Express is a play on the famous Federal Express slogan of the 1980s: "When it absolutely, positively has to be there overnight." Capitalizing on their fast, efficient service, Federal Express (now called simply FedEx) was the largest overnight shipping company in the world by the 1990s. Rayner lives at 132 Bleecker Street in New York City. This address would put him on the campus of New York University in the Greenwich Village neighborhood of Manhattan, New York City. Though Rayner is an artist, he is no student. Booster Gold and Plastic Man arrive in Blue Beetle's Bug to aid Rayner against the army engaged to recover the misdelivered package. Why Plastic Man is substituting for Blue Beetle is unexplained, though it may have to do with Beetle's participation in the L.A.W. (Living Assault Weapons) mini-series with other Charlton Comics characters around this time. Plastic Man more than makes up for the lack of Beetle as comic relief. FASHION ALERT: Throughout this issue, Booster's Mark XI armor is colored gold and black instead of the traditional (and previously depicted) deep blue. This appears to be the choice of the issue's inker or colorist, not a change in costume design. Booster compares the villains that Rayner has been fighting with the Campfire Girls. The Campfire Girls are an American youth organization originally founded in 1910. Though the organization has been coeducational since 1975, the groups' reputation as an organization of wholesome girls has persisted in popular culture. 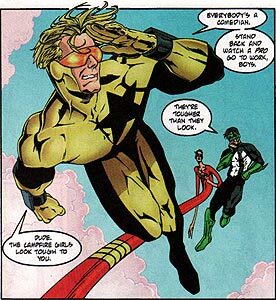 Rayner chastises Plastic Man, who, like Rayner, is an active member of the Justice League, for partnering with Booster Gold. Rayner claims that page 167 of the current JLA handbook states," Any member identified as spending time with Booster Gold and/or Blue Beetle is subject to immediate expulsion." Though Rayner is presumably joking, Booster and Beetle have indeed abused the League (and its good name) in the past, including embezzling funds and misusing real estate. Despite Rayner's continued slander of Booster's abilities and personality, it is Booster who suggests the strategy that allows the heroes to salvage the mysterious package. Boosterrific Review: It seems that so long as Dan Jurgens is still writing comic books, there will always be a place for Booster Gold. This Jurgens-written issue features an unusual team-up of Green Lantern Kyle Rayner, Booster Gold, and Plastic-Man that is every bit as enjoyable as the idea of a meeting of the three characters would suggest. Booster is at his selfish best, Plastic-Man is his usual, crazy self, and Green Lantern gets to play the unusual (for him) role of competent straight man to the antics of his companions. As usual Jurgens brings his expected action and forgettable villain, so longtime fans will get exactly what they expect from this issue.